In 1992 this article was published in the Wendish language in “Serbska Protyka”, the Wendish yearbook. It was written in English by Kevin Zwar, and translated by co-editor Alfons Frencl into Wendish. 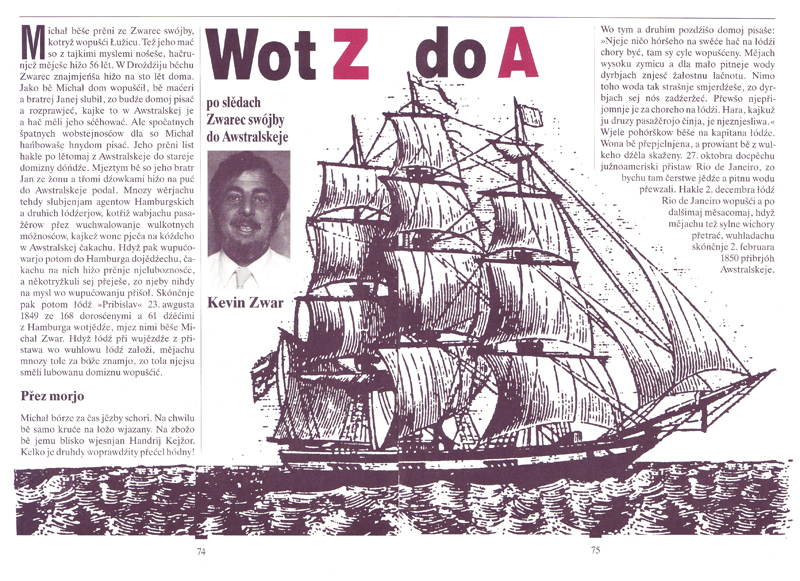 The article as it appeared in “Serbska Protyka”, the Wendish yearbook, in 1992. There is a story passed down the Zwar family in Australia that Michael Zwar hid under a load of vegetables to make his escape from Lusatia because of the military situation at the time. I do not know if this story is true. When Michael wrote his first letter home from Australia he did not mention this incident. Michael was the first of his family to leave Lusatia. His brothers were considering leaving too. Even his mother was thinking about going overseas even though she was 56 years old. is written on his papers. Maybe Michael could not get an exemption. On August 23rd the Prubislav sailed from Hamburg and Michael Zwar was on board. In the Drehsa village, the Zwahr family home for at least 100 years, Michael left behind his mother with others from his family to care for her. He left behind his sister Maria (22 years old) and four brothers: Andreas (31 ), Johann and his wife Magdalena (nee Schmaal ) and daughter Maria; Peter (25) and Karl (13). Michael’s father had died nine years earlier. It is perhaps typical of the times that five other brothers and a sister had died before surviving childhood. When he left home Michael also promised to write and tell his mother and his married brother Johann what it was like in Australia and whether they should follow him too. Things went so badly for Michael that his first letter home from Australia only arrived nearly two years later. Michael was too ashamed to write home earlier. When he was starting to get on his feet and had actually bought some land in Australia he wrote home to report on all that had happened to him. By then Johann and his wife Magdalena and their daughter Maria had already left for Australia too. “This one is migrating, that one is migrating, and so I’ll migrate too”. When they arrived in Hamburg a series of incidents soon change their minds and some were wishing they had never thought of the idea. The first shock waiting for them was the sad news that Pastor Andreas Pench had died in Berlin on his way to Hamburg. The newspaper of August the 4th had reported how Pastor Pench had spoken his words of farewell to his people, and how he was about to commence his time of service as spiritual leader of the migrants to Melbourne in that richly blest land of Australia. Now he was dead. Even his possessions were already at Hamburg, as others had brought them along for him. It is interesting to ponder how Pastor Pench would have fared if he had lived to go to Australia and whether the religious life of the Lutheran people in Melbourne might not have been a much better one in those early years. There was no Lutheran pastor within about 700 kilometers of Melbourne until 1853. Only one Wendish speaking pastor went to Australia. Pastor Kappler had gone to South Australia in 1848. He later visited the Wends in Melbourne. A second disappointment was that there was no ship waiting in Hamburg to take the people on their voyage! So they had to find and pay for accommodation while they waited. They booked into the guesthouse “Zum Wilden Mann’‘. Adding to these worries, Hartig now demanded more money than they said he had previously mentioned. There were other discoveries about Hartig which soon had them cursing the day he had been born! “the Wends had money and were good people and they would pay for them etc”. When the Wends arrived and were informed about Hartig’s generous offer on their behalf they did not want anything to do with the Germans who were to be their shipmates. At Hamburg the intending passengers learnt for the first time that Mr. Hartig and his wife were not actually coming on the journey with them. They had received the definite impression that he and his wife would be coming with them. The feelings about Hartig and his wife grew stronger each day. Some of them claimed that Hartig’s wife had bewitched them, so to speak! The Wends decided that as Hartig was so crooked they did not want to go to any place (eg. Melbourne) recommended by him. It would surely be as evil as he was. Pastor Pench’s brother arrived from Ebendorfel to collect his brother’s belongings. Hartig would not let him have them unless he paid out 70 Thaler (almost the fare to Australia, and a lot of money to pay for not taking a dead man anywhere!). But Hartig said that he had to attend to this and that for the deceased Pastor Pench and he would not be handing over his possessions until he had been paid. Pench went to the police who directed him to the council. At the council he learnt that Hartig had quite a reputation. He had brought migrants to Hamburg before and he had always fallen out with them. The council advised Pench to pay 20 Thaler, although he could stay and fight the case with Hartig but this would possibly cost him more. Pench paid Hartig 20 Thaler and received his dead brother’s belongings. The Wends had time on their hands. They attended church each day. Agnes, a child of the Wend Wuchatsch was baptized. Johann Maltzahn and Sophia Schlunz were married. At a communion service an elderly Pastor told them that it was not God’s will for them to go to Australia. He preached to them about Abraham and his call to leave home. The Pastor then pointed out to the intending travelers that they had not received a call from God to leave their land and that God had not promised to go with them and bless them. Following the death of their Pastor, the pious christians among them must have been having second thoughts. Now a ship was being prepared for the journey. They could go on board and watch the carpenters installing various fittings and 250 bunks. They were double bunks placed alongside each other in double rows. There was 3 metres of space between the floor and the ceiling. A rumour suddenly swept Hamburg that the Prussian army was returning home from Schleswig Holstein via Hamburg and that this would cause riots and fighting. The Wends were terrified. They could remember how the Prussian troops had put down the uprising in Dresden only three months earlier. But nothing came of it. The Prubislaw finally left Hamburg under Captain Wilhelm Nielsen on August 23rd 1849 with 168 adults and 61 children. Even this was not achieved without a serious accident. As they were sailing out of the harbour they rammed a smaller coal ship which sank with all on board. The Wend Hoehne later recalled all these terrible incidents as signs from God that they should not have left their beloved homeland. There were many complaints on board about the captain, the overloading of the ship and the spoilt condition of the food supplies. They arrived in Rio de Janiero on October 27th to take on fresh meat and water. The passengers published a bitter letter of complaint against Knorr and Jannsen, the Hamburg forwarding agents, about the captain and the conditions on board and the rotting food. This delayed their departure. This complaint and similar ones from other ships led to some German states passing stricter regulations governing conditions on board ships taking emigrants overseas. The Prubislaw finally left Rio on December 2nd and two storms and two months later they saw the Australian coast (on February 2nd 1850). The Prubislaw docked at Williamstown near Melbourne on February 3rd 1850. Four other shiploads of emigrants from Germany had landed there in the past year. (During 1849 the Godeffroy in February; the Wappaus in March; the Dockenhuden in April; and the Emmy in December). Another shipload also arrived on the Alfred in February 1850. These ships brought the first large numbers of people to Melbourne from Germany. Melbourne was a new colony which had been unofficially founded by free settlers only 16 years earlier who had ‘bought’ the land from the aborigines with presents like axes and mirrors! The nearest large settlement was almost a thousand kilometres away. When the Prubislaw arrived in Melbourne there were about 23,000 people in the new town, and about 1000 of these were now from Germany. Some had come because the government had offered a bounty of five pounds sterling for each of the first 200 vinedressers who arrived from Germany. William Westgarth had travelled to Germany in 1847 to encourage people to take up this offer and he had circulated pamphlets in some German States. Westgarth battled for years to get the government to pay the bounty to new settlers. There were many hassles and meetings before 600 pounds was paid out. Dr. Alexander Thomson, who lived about 90 kilometres from Melbourne had sponsored 10 families, and the following year Michael Zwar went and worked for one of them. I doubt whether many people in Lusatia in 1991 have a good knowledge of Melbourne and of Australia. I think that few would realize that Melbourne is a modern city with over 3 million people. I think that the Wends who arrived in Melbourne in 1850 had no idea at all what it would really be like. It was a primitive pioneer settlement nearly 1000 kilometres from civilisation. There were several thousand Germans and other Wends nearly a thousand kilometres away, also beginning a new settlement in South Australia. The first large group of Germans arrived there in 1838 and were better established than those in Melbourne. Some of the passengers on the Prubislaw travelled on by ship Adelaide in South Australia. A strange co-incidence happened 120 years later. I preached in the Grovedale Lutheran Church as a guest pastor in 1981. After the service a Mr. Rossack said to me: “Are you related to the Zwar who worked here for a time in the very early days of settlement?” If he had asked me this question before I had read Michael’s first letter home, I would have said “No” because we had no knowledge that Michael had ever lived there. When I said “Yes”, Mr. Rossack told me this story. Whenever they had to plough a certain paddock on their farm their father (and grandfather before then) would tell them to keep their eyes open for Zwar’s pot of Gold. Apparently when Michael had gone to work there in 1851 he had buried some gold sovereigns in the paddock among some trees. When he left (probably the following year) he went to dig them up again but he could not find the right place. Presumably the money is still there! Michael did not live in that area again, and if it were not for his letter home and this unusual story his descendants would not know that he had lived there. It was typical of the Wends who came to Australia that Michael Zwar would buy land and become a farmer. It is also understandable in Michael’s case because both his father and his grandfather are described in records as “Gartennahrungsbesitzers in Drehsa”. Working on the land was a family tradition. However many Wends who came to Australia held different occupations, like carpenters or blacksmiths, but nearly everyone bought a farm. I think there are a number of reasons for this. The main reason was the certainty they expected this to give them for their future security, economically. The Wends had seen how the landowners were the wealthy people in Europe, particularly when the feudal system ended. (Drehsa had been a feudal village!). If one owned 80 acres of land in Lusatia one would be sure of a secure future in the 1850’s. When the Wends came to Australia it was soon possible to pay a deposit on 80 acres of land. One first had to become a naturalized Australian and then one could buy and sell land. Michael Zwar was naturalized on 1st October 1852. Wanting to buy land was the main reason the Wends gave when they applied for naturalization. The Wends at first felt proud when they were the owners of 80 acres or so of land, but they soon found out that the land was not as fertile in Australia. There is also a lower, and in many areas unreliable rainfall, so a person needed much more than 80 acres to be a successful farmer. Then they needed more land when their children grew up. Michael Zwar was able to buy more land nearby at Broadford, and in later years some of his children were also able to buy more land nearby when they grew up. Some Wends and Germans would sell out and buy larger properties further inland as new lands were opened up. Peter Zwar, Michael ’s brother who settled in South Australia was a carpenter by profession. He built a number of houses in the Barossa Valley in his early years, but at the same time he had bought a small piece of land. He then sold this and moved to a larger property at St. Kitts. About 1880 he sold this farm and moved about 160 kilometers north to a better property near Appila. Then he sold this and bought another property nearby at Wirrabara. In the 1880’s Peter also helped his son Johann put down a deposit on a square mile of land near Booleroo Centre, and Johann worked this land, but in the big depression of 1890 they lost this property. It is said that as a result Peter never helped his children buy land again. They had to do it themselves! The first World War, and then the 1929 Depression, followed soon by the Second World War meant that the farmers always struggled. They lived frugally for about three generations. The war in Korea in the 1950’s helped the Australian sheep farmers because it created a big demand for wool and they received record prices. At the same time most farmers began to prosper, including wheat, cattle and dairy farmers. Many of the Wends had a mixture of wheat, barley, oats, sheep, dairy, pigs and fowls. The 1950’s was also the time when the children of many Wend and German families took up other occupations and a number moved away from their family district. Quite a few are still on farms, but many have also moved out. Another reason the Wends took up farming in Australia was that they were not fluent in the English language and this made it difficult to work in many trades. In addition to this in the early days there were many tradesmen from England and Ireland, and far too few farmers. The Germans and Sorbs helped to fill this gap. Johann Zwar, another brother of Michael, who settled in the Barossa Valley in South Australia became a homeopathic doctor. However he still owned and lived on his farm. He built several rooms onto his farmhouse which were a small ‘hospital’ for his patients. Most of his children went onto farms, and two became medical doctors. Dr. Bernard Zwar became the head of the medical profession in Victoria. He laid the foundation stone for the Royal Melbourne hospital. In 1905 Dr. Bernard Zwar visited Lusatia and his relatives at Drehsa. Michael, Johann and Peter Zwar each had at least 10 children. There are hundreds of descendants in Australia today. Many are still on farms. Three of Michael’s children were exceptions. Near Michael’s home at Broadford there was a tannery, so one of the sons went to work there. Eventually three of the sons owned their own tanneries. They were quite large, employing over 200 people in one of the tanneries at Beechworth. Albert and Henry Zwar became prominent business people and each also became a member of parliament. It was quite rare and a tremendous achievement for the first generation of Wends born in Australia to become political figures in Australia’s early history. The Germans and Sorbs soon intermarried in Australia. They tended to form communities together and they often went to the same church and school. There were not enough Wends to form a congregation so they worshipped with the German Lutherans. Johann Zwar settled at Ebenezer in South Australia where there were a number of other Wends and they held Wendish lay-reading services and the Wends held family devotions in the Wendish language. Ebenezer is the only place I know of in Australia where there was a Wendish school. Maria Zwar, the daughter of Johann, came to Australia as a little 3 year old girl in 1851. In a brief life story she wrote that she went to the Wendish school in the 1850’s and she added that she could not understand the German language at this time and it sounded to her like ‘geese chatter’. She then finished her schooling in German because the Wendish school closed. Johann Zwar, her father was a lay church leader and was proficient in German. He taught confirmation classes in German and wrote a brief history in German when the Lutherans celebrated their 50th anniversary of their arrival in South Australia. There was a definite language pattern over the generations. The first generation of Wends who came to Australia spoke Wendish at home and also when they visited each other, especially in their old age. They went to the German speaking church, where their children also went to school. After some years the parents would still speak to their children in Wendish, which the children understood, but the children would reply in German, which the parents also understood. The children grew up as a German speaking generation who also understood the Wendish language. During the first World War all the German schools were closed. The children went to English speaking schools. After a time their parents would still speak to their children in German, which the children understood, but the children would reply in English, which the parents could also understand, although they could not speak it very well. When the children grew up they could still use swear words in German, just as their parents would still remember Wendish swear words or curses! By the end of the Second World War everyone spoke English. Many parents could also speak German. When parents did not wish their children to understand what they were talking about they would still use the German language! Today there are only a few who can speak any German at all. If they do, it is usually because they learnt it at secondary school. This makes it very difficult for Australians to correspond with their relatives in Lusatia today. There are probably about as many Wends in Lusatia who can speak English as there are Wend descendants in Australia who can speak German. Apart from university professors of the Slavic languages, no one can speak the Wendish language in Australia. Maybe there are a few who have come to Australia since the Second World War, but I have not met any. Michael Zwar’s family was an exception to the above language pattern over the years. When Michael Zwar settled on his farm at Broadford it was not a German settlement. The nearest German settlement was at Dry Creek where his wife Agnes nee Zimmer came from. They often visited the Zimmers there. The District was later called Westgarthtown and now is called Thomastown. (Robert Wuchatsch, a Sorb descendant has written an excellent book on the history of this German/Wend settlement). When Michael Zwar first arrived in Melbourne there was no Lutheran Church and no Lutheran minister. The Wends and Germans met for worship in an independent or Congregational Church. The services were taken by laymen in the German language. About 30 people would attend. It was an historic building. It was the first permanent (brick) church in Melbourne, and was dedicated in 1839. John Pascoe Fawkner was one of the founders of the city of Melbourne, and a Congregationist, and he instigated the building of the church. When the first Lutheran Pastor was installed in 1853 the Lutherans held services in this church on Sunday afternoons. I have a list of 326 signatures of Lutherans who signed a petition to the government to ask for assistance to pay the salary of Pastor Goethe. Michael Zwar signed it, as well as a number of other Wends. When Michael Zwar moved to Broadford he signed a petition asking the government to allow them to open a German school at Broadford, but their request was refused because there were not enough children for the school. Michael’s ten children all went to the local English school. This first generation of Wend children born in Australia spoke English. They could also understand German, and the older ones could speak it fluently. When they grew up and became important businessmen and members of parliament they faced the problem of being identified as Germans. In the first World War the Government took a national vote to introduce the conscription of soldiers to serve in Europe. It was defeated. So another vote was taken, and all people with German ancestry were not allowed to vote, even though they had been born in Australia. The matter was defeated again, by a greater margin than the first time. There was a lot of persecution of Germans. Albert Zwar’s big tannery was burnt down one night. No one was ever charged with the crime! It was pointless for the Wends to say that they were Wends because no one in Australia had heard of them or could understand how a little Slavic group could maintain a separate identity in a German country. Some Wends tried to overcome the problem by saying that they were Polish. As a result there are still Wend descendants in Australia who think that their ancestors were from Poland. Henry Zwar, who was also a politician and a tannery owner, used to publicly make a lot of the fact that his ancestors were Saxons, who hated and fought wars against the Prusslans. He even told how his own father (Michael) had fought the Prusslans and personally helped to win a battle against them. I think this is where the story may have developed that Michael Zwar hid under a load of vegetables to escape from Germany and come to Australia. Michael Zwar’s family was also an exception to the norm because his children did not grow up in the Lutheran Church. There was no Lutheran Church nearby. Today there is still no Lutheran Church anywhere near Broadford. Most of Michael’s children were baptized in the local Church of England, although several were baptized in Melbourne. His descendants grew up in and were active in the Anglican and Presbyterian churches. Today one is a minister in the Uniting Church. This phrase has been coined to describe one of the big problems facing Australians. Distance has a powerful influence on the life of Australians. Any visitor to Australia soon becomes aware of the long distances of this big country. Michael Zwar settled in Victoria. When Johann came several years later he intended to go to Victoria too. His ship the ‘Helene’ called in at Adelaide in South Australia on the way. The Wends there talked the new Wends into staying there to help with the harvest, with the possibility of going on to Victoria later on if they wanted to. It was about 400 miles away. Some of the Wends did go to Victoria later on (Burger, Rentsch, Hundreck, Mirtschin), but Johann Zwar stayed on in South Australia. When Peter Zwar went to Australia in 1854 he went and lived with Johann before buying his own land. He stayed in South Australia. When their nephew Ernst went to Australia in 1880 he too settled in South Australia. Over the years the links with Michael’s descendants in Victoria and the Zwars in South Australia were broken. By the 1950’s the descendants had lost all contact with each other. Some did not know that the others existed. Only in recent years have these contacts been renewed, as descendants move interstate to live. There is also an awakening of interest in family history. In the 1920’s Johann Zwar’s son Johannes was still corresponding with the relatives in Lusatia. I do not know of any contact after that time until contact was renewed in 1984. I have been gathering history of the Zwar family for the past 20 years. I often wondered if there were any relatives in Germany. We suddenly renewed contact about two weeks before I was due to visit Europe in 1984. It was a highlight of my life to be able to go to Lusatia, although only for a few days, and to meet the long lost relatives who treated us wonderfully well. I shall always remember the visit to Drehsa and how we walked down the street looking for the spot where the Zwar home had originally stood. And we found it! Maybe one day I will be able to go there again. The distance and the language both make it difficult to keep up contact between the Wends in Lusatia and their relatives in Australia. In 1990 we were delighted and honoured to have Alfons Frencl visit us in Australia. I am sure his visit will do a lot to retain links between our people in Lusatia and Australia. It would be good if others could also visit. With the changed political scene it might be much easier for us to visit one another and to maintain links for the future. I hope so. Lenka Sauer [nee Mihan] had grown up in Drehsa, and then moved to West Germany. She read the above article in the Wendish Yearbook with great interest as she was related to the Kaiser family, and one of her ancestors had married Johann Zwar in Australia. Lenka also had in her possesion many letters sent from Australia by the Johann Zwar family in the 1800’s and later, plus a number of photos sent from Australia. Lenka made enquiries and as a result she wrote to Kevin Zwar in Australia, who was of course delighted to make contact. Kevin sent Lenka some material, including a faded photo Dr Bernard Zwar had taken in 1905 in Saxony showing two couples and a baby, on the remote chance Lenka might be able to identify the people in the photo taken in Drehsa nearly 90 years earlier. Lenka immediately recognised the photo taken of herself on the day of her baptism; she is the baby along with her Mihan parents and grandparents!